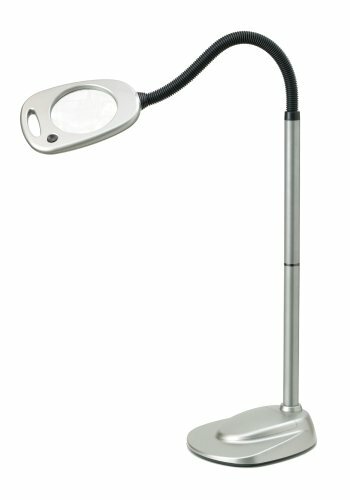 The Fulcrum Magnifier Floor Lamp offers improved vision and plenty of cool light, allowing you to work up close without straining your eyes. Great for activities like reading and sewing, this illuminated magnifying lamp increases your field of vision when you need to see every last detail. The large 5-inch diameter lens has 2x magnification power with a 6x inset for fine details. Its 12 glare-free LEDs are positioned directly below the lens to illuminate the viewing area. Its stable, stationary base supports a flexible gooseneck that allows you to position the lamp exactly where you need it. 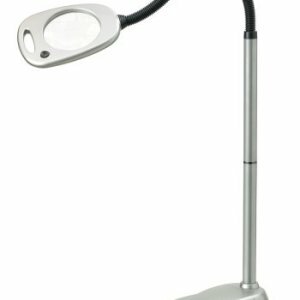 The Magnifier Floor Lamp comes with an AC adapter, but may also be operated wire-free with three alkaline D batteries (not included). 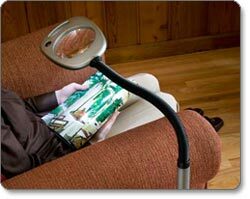 Adjustable neck allows you to position magnifier lamp precisely where you need it. View larger. 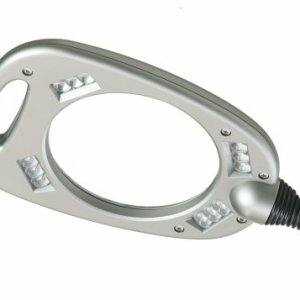 12 LEDs with floodlight technology illuminate a wide coverage area. 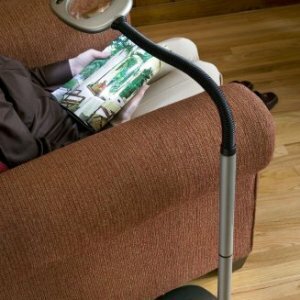 Ideal for hobbyists, collectors, and those who suffer from eyestrain or low vision (macular degeneration), the Magnifier Floor Lamp provides an enlarged view with startling clarity of objects or text with an optical-quality acrylic lens. 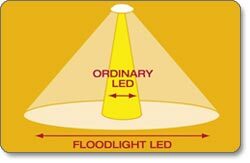 It features LED flood technology to illuminate a wide coverage area with bright, glare-free light. The lamp has a stable, stationary base with a durable metal gooseneck, so you can position the light exactly where you need it–at a table, desk, workbench, or your favorite chair — and keep it there. The large 5-inch lens has 2x magnification power with 12 glare-free LEDs, so you can easily read a book or newspaper, or view your entire task area. You can also use the 6x loupe inset for reading fine print or closely scrutinizing an object. 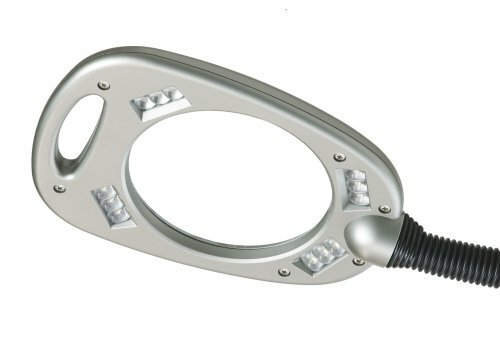 The 12 LEDs are rated to last 100,000 hours, so they’ll never need changing or replacing. Additionally, they emit little or no heat when compared to incandescent lamps, so working for extended periods of time under and around the lens will be more comfortable. These lights can be turned on and off with the press of a button conveniently located at the top of the magnifier. 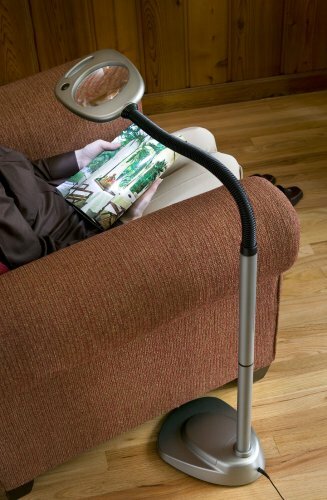 The Magnifier Floor Lamp measures 53 by 9 by 11 inches (H x W x D) and weighs 12 pounds, so it’s easy to move around. 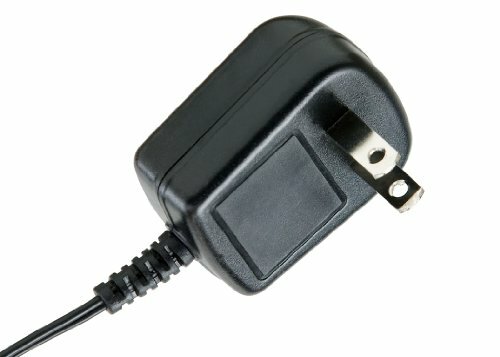 Dual power options mean you can use the supplied AC adapter or three D batteries (not included) for 60 hours of energy-saving operation, as well as easy portability. 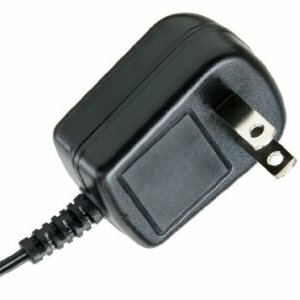 Floor lamp and AC adapter.